>You can follow this Blog on Facebook and Twitter, Become a Fan Today! Breaking News From the Tropics! Will the hot weather last? 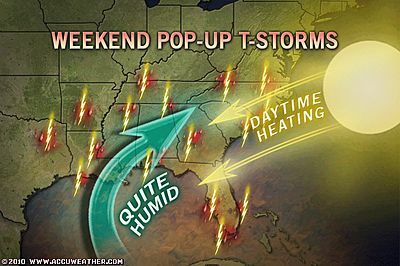 A day of 90s across basically everywhere across the region, a uniform 91-94 anywhere from Dallas to Atlanta as storms and cloudiness associated with a front will trigger widespread thunderstorms, the ignition, the daytime heating. Those storms will lead to a trimming of highs of what may have been more mid-90s for places like Atlanta, as for the central and southern portions of the region from Baton Rouge down to New Orleans it’s less stormy, more sun, humidity and indeed more uncomfortable conditions as there’s less chance of storms, therefore we won’t see the cool rain and downdraft cooling. It’s all about the Bermuda High folks which sets up residence over Southeastern airspace from May through September and it’s a long road ahead if you hate heat and humidity As for the Carolinas down into Florida, it’s going to be a hot day with highs again topping the mid-90s and with the geography of Florida, surrounded by those bath tub warm waters, sea breezes that are triggered when the land heats converge and spark 11am to usually 5 or 6pm thunderstorms for many areas of the state, easing those very hot afternoon temperature readings a little. Lows across the Southeast are as usual, low to mid-70s for interior areas, mid to upper 70s with an 80 in spots like Miami and Galveston where it’s more humid thanks to close proximity to warm waters of the Gulf or Atlantic. A vastly cooler day today throughout the Northeast compared to the 100 around DC, 97 for Philadelphia and 95 around New York City. Even Boston enjoyed 94 degrees, ouch! Highs today are generally in the 80s from Boston to Philadelphia and around 90-91 for Baltimore to DC. A front pushed through late yesterday which brought intense thunderstorms throughout the region which has allowed though very sunny conditions today, a good 10-15 degree cooldown basically everywhere. If you don’t enjoy the heat, unfortunately it’s appears Sunday weill be another day similar to yesterday.. That’s right another 100 in DC is possible! The pattern is becoming better established, certainly in terms of the heat as highs once again near or surpass 110 for the deserts with 100% sunshine. The coast as always starts cloudy and foggy, those clouds that have progressed inland during the overnight thanks to land cooling will retreat back to it’s origin along the coast as the reversal of land heating takes place, allowing most places to be sunny, comfortably warm with 70s at the beaches and a 5-15mph sea breeze. After lows around 60 for Downtown LA it should warm to around 80 by 1-3pm with mostly sunny skies and NW breezes off the ocean. Highs should top around 115 for Death Valley with a low of around 80. Phoenix 110, Lo around 84, Las Vegas around 107, Lo around 83. There is likely some high elevation showers and storms rolling over the Four Corners region today! A day of sunshine for the coastal and central areas of Washington and Oregon with highs around 72-74 for Seattle, low 80s for Portland and 80s for areas east of the Cascades. Rains and thunderstorms will effect many areas of Montana and northern Idaho. Lows tonight range from the 50s along the coast, inland 60s and then 50s and 40s for the mountain areas. Many areas of the Southern plains will see warmth with low to mid-90s spread uniformly throughout most of Texas with a chance of thunderstorms popping up almost anywhere. Houston to Dallas to Lubbock are all in for a low to mid-90 degree day with showers and thunderstorms likely or at least have a chance of seeing them form in your area. Lows also will be very uniform throughout the state the low to mid-70s for the west of Texas and Oklahoma, mid-70s for eastern Texas and upper 70s to around 80 the closer you get to the more humid air hovering near the Gulf. Today will be a two-way split from the N. Plains to Lower Midwest, showers and some heavy will spread across the E. Montana to N. Minnesota area whilst another area of showers and thunderstorm develop over the central Plains and into the mid-Mississippi valley. From Bismarck to the Twin Cities where showers and embedded storms are expected high will top the low to mid-80s, across the in-between area, from Denver to Iowa City to Chicago we can expect mid to upper 80s with good spells of sunshine. Mark City-Cast as follows: Minot, ND, Hi 83, Lo 58 (rain, likely) Minneapolis, MN, Hi 84, Lo 60 (rain showers/possible t-storm), Chicago, IL, Hi 88, Lo 73 (sunny), St Louis, MO, Hi 93, Lo 75 (t-storms possible). 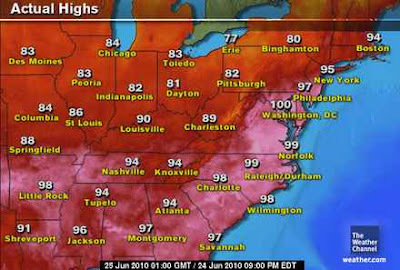 PHILLY’S 97-DEGREE HIGH WAS WARMEST SINCE JUNE 2008, WASHINGTON REACHED 100. 75mph winds roared through Greater Philadelphia last night as thunderstorms rolled eastward from the Ohio Valley and intensified as they approached the eastern Pennsylvania metropolis which was basking in 97 degree air. The very fact the air was that warm, explains why those thunderstorms became severe and severe thunderstorm warnings were issued all the way to Boston as the air was sweltering and indeed tropical in terms of the humidity which averaged the mid-60s but topped 70 in spots throughout the Northeast yesterday. THE NATURAL STEAM BATH OF THE COASTAL CAROLINAS! It was 98 degrees all the way to the Atlantic seaboard city of Wilmington, NC and 99 degrees in Norfolk, Va. 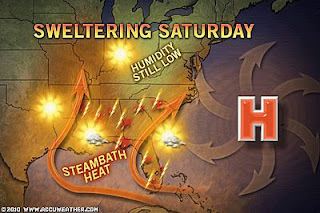 Throughout the Carolinas the high yesterday hovered right around the 100-degree mark and coupled with some of the highest dew point air in the Southeast, this created a dangerous tropical-cocktail. Philadelphia topped 97 degrees which was to my surprise the warmest since way back on June 10, 2008! LaGuardia, New York warmed to 95 degrees and Boston topped an impressive 94 degrees before the storms rolled in. SUNDAY MAY SEE A REPEAT OF THE HIGHS SEEN THURSDAY! It is possible that we take another run at the 100-degree mark Sunday in DC and the upper to mid-90s from Philadelphia to Boston. You’ll also see lows struggle to get below 80 for Washington whilst it may fail to drop below 75-77 for Philly and New York City. The urban heat island plays a major role in these big cities at retaining daytime heat. All that concrete and asphalt absorbs the solar rays of the sun by day and then releases it back into the air at night, explaining by in August 2006, La Guardia Airport,m New York after topping 102 degrees during the day, failed to drop below 87 degrees… A new all-time warm low! Check out the Facebook Fan Page to view my latest Video-Blog which talks about the Tropics. Tomorrow I shall talk tropics in this segment. Stay tuned! In sympathy, the western trough off the coast suddenly shot into action, and precipitated heavy rains along the Konkan/Goa coast on Thursday (24th. ), wiping out the fears of reducing rainfall there due to the “break Monsoon” scare. And, the monsoon axis, as if in obeyance, has retreated its threatening stand, by forming a core of 992 mb far away from the Indian land mass,deep into the Sindh desert. The correct place for the western end of a typical axis. The low in the bay is likely to become ‘well marked’ soon.That’s the repeated expectation since the last 24hrs,but as and when it does, it should travel west into India, and merge into a W.D. approaching from the northwest, and set up rains over the Gangetic plains, and rain in some places in the North, bringing some respite from the severe heat. But as estimated, the interiors of the peninsula region are relatively drier. Rainfall figures of interior Maharashtra and peninsula cities are still wanting, and rains are badly needed there. And may remain so for the next 2/3 days. Read our partner’s blog in-full HERE! Forecast: Who knew 90 would feel nice? A generally overcast day with no rain. It was warmer and more humid.